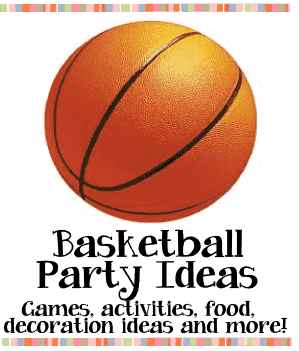 Basketball themed party ideas including unique ideas for decorations, party games, activities, invitations, party food, favors for girls and boys. Make basketball theme invitations for your party with cardstock and a little imagination. 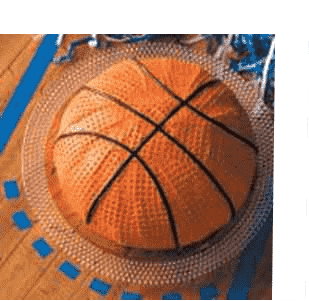 Basketball Invitations - Fold a piece of cardstock in half - trace the shape of a basketball on the cardstock making sure to leave the top of the basketball on the fold of the paper. When you cut out the basketball the front and back should be connected at the fold. Paint or color the cards orange and paint on black stripes. On blank white note cards glue basketball trading cards or pictures of your favorite team using the player who's jersey number corresponds with your child's age. On the inside write - "Everyone is celebrating Johnny's 9th birthday!" Basketball Jersey - Another fun idea is to make a cutout of a jersey with cardstock. Draw a jersey on a piece of folded cardstock or a blank note card. Keep the top connected at the fold. Then color or paint the jerseys your team colors. For a jersey number place the age of your child and the teammates name who corresponds with that number - or your child's last name. Basketball Game Ticket - Make the party invitation look like a game ticket to your favorite basketball team. The main event will be the birthday child's name and birthday. There are several templates you can use to create the ticket invitation or have them printed for you. Basketball Invitations - Use small plastic basketballs - about 3" in diameter - as your invitation. Write the party details on the basketball with permanent black marker. Invitation tip: On the invitation ask guests to wear their favorite Basketball teams jersey to the party. Choose your teams favorite colors and decorate the birthday party with balloons and streamers. Buy or make pompoms and place them on the tables or hang them from the walls. Decorate the walls with posters of your team or favorite players. Decorate the food table to look like a basketball court. Use a light brown tablecloth and some pin striping tape to create the lines on the court. Place a small net on the table and give each guest a Nerf type basketball at their place so they can make practice shots. are set to help with the games and keep the kids moving in the right direction during the party. birthday wish for the Birthday child. Piñata - Have a basketball shaped piñata filled with candy and basketball theme toys. Hang it from a basketball goal during the end of the party. shoot first. The first player chooses a spot on the basketball court and tries to shoot a basket from that spot. If he makes the basket then the next person in line must try and make a basket from the spot where the first player shot the ball. If they miss the basket then the next player in line chooses a spot and tries to shoot a basket. If the first player makes the basket, but the second player misses the basket then the second player gets a letter in the word HORSE. Then it is the next persons turn to try and make the shot. When a player misses enough shots that they have spelled HORSE, they are out of the game. Try these fun contests at your Basketball Party. Award prizes to the winners of each event. 1. Free Throws - how many free throws each guest can make in 2 minutes. 2. Dribbling - have a contest to find which child can dribble the basketball the longest without stopping. 4. Backwards Dribbler - Same as above only instruct the players they must dribble while walking/running backwards. 5. Granny shots - who can make the longest granny shot. 6. Who can spin a basketball on their finger the longest. Set out tubs filled with ice and Gatorade.